My eyes were so strained for a few days. It was getting worse for a while so I started to get a little worried. I only just realized later that it is from spending too much time on my mobile phone games. I usually play games on PCs. My monitor is nice and comfortable to look at and it doesn't really effect my eyes too much. The strained eyes came from playing games on my little mobile phone. I tend to hold the mobile phone very close to my eyes - about 15 cm away from my eyes. I took it easy for a few days. The eyes are back to normal now, thankfully. Here's an example of how it works. You can see the blue sparkles in the picture below. This secret path is in the Port city of Lar shop. Good tip, Kido. :) Thank you! Just keep seelong dishes man! Once you unlock ostenlein you should be making enough money yo just travel to ostenlein every day to restock. If not, cud it takes time to get the hang of bar sales, then you'll have to go to the two dungeons you have so far. Either way though, you just keep selling dishes! 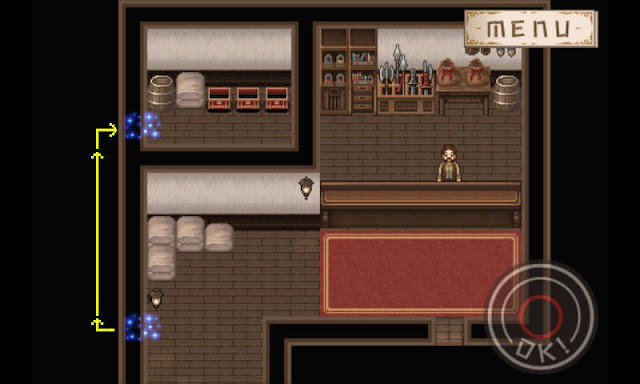 All the plot points in the game revolve around the bar increasing in sales. Hey Enna, where the misto plant ingridient was?